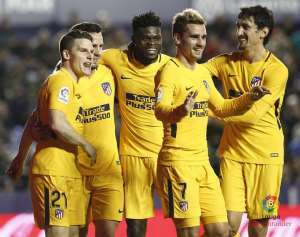 Thomas Partey's Atletico Madrid have been left with a squad of 20 players for the season after Yannick Carrasco and Nico Gaitan moved to Chinese side Dalian Yifang. 17 of them are outfielders, for the 20 games they have left - 13 in La Liga and seven in the Europa League, should they reach the final. There is little internal competition now. In midfield, they only have two players who can play out wide, Angel Correa - a striker - and Vitolo. Simeone usually puts centre-midfielders like Koke and Saul into wider positions. Thomas Partey and Gabi Fernandez complete the reduced list of midfielders - six options - counting striker Correa. There are seven defenders (Juanfran and Vrsaljko at right-back, Filipe Luis at left-back, Lucas Hernandez, Diego Godin, Jose Gimenez and Stefan Savic in the middle) and three keepers - Jan Oblak, Miguel Angel Moya and Axel Werner. Up front, they have Diego Costa, Kevin Gameiro and Fernando Torres to go with star man Antoine Griezmann.